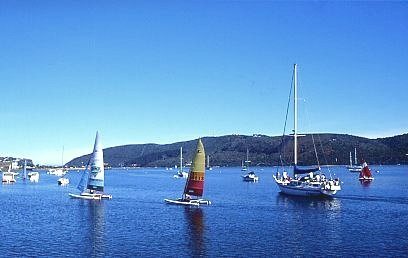 Knysna, pearl of the South African Garden Route, is one of South Africa's best known travel destinations, and takes pride of place in the “Top 100 Destinations in the World Trip Advisor 2008 Travelers’ Choice Destinations Awards’. The area comprises Knysna, Sedgefield, Brenton, Noetzie, Rheenendal, Belvidere and Buffalo Bay. Indigenous forests, fynbos, lakes, rivers, mountains and beautiful coastlines combined with a moderate climate, make the Knysna area a natural Eden. A natural paradise of lush indigenous forests, tranquil lakes and golden beaches adorns South Africa’s unspoilt southern coast. 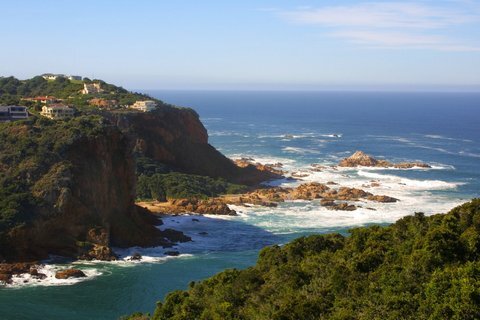 Nestling on the banks of a shimmering lagoon in the heart of this ‘Garden Route’ is the picturesque town of Knysna. Beaches, lakes, mountains and rivers provide endless opportunity for leisure and outdoor adventure. Within the town, craft shops, flea-markets and cosy cafe’s beckon with small-town charm and hospitality. In accounts of its earliest history there is no reference per se to the town of Knysna. 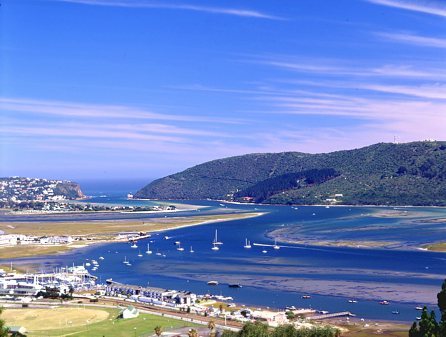 The "Knysna” as early travelers, surveyors, and settlers called it, referred to the river, which opens onto the large tidal estuary before exchanging its water with the sea through the narrow gap between two rocky promontories known as "The Heads”. Knysna is a Khoi word: scholars are uncertain of its exact meaning, but it probably symbolizes water. What makes Knysna in the Garden Route so unique, is the fact that not only does it nestle on the banks of an estuary, in the heart of the "Garden Route”, it is also surrounded by a natural paradise of lush indigenous forests, tranquil lakes and golden beaches, making it a real natural wonderland. 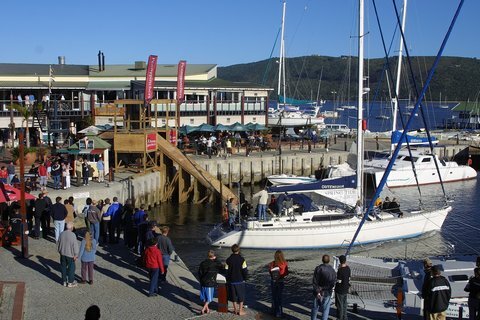 Visitors are spoilt for choice with a kaleidoscope of unforgettable experiences to choose from: leisurely relaxation to high energy adventure, sporting activities to shopping, cappuccino to haute cuisine’ the famous Knysna oyster or a taste of the locally brewed beer – Knysna, Garden Route has it all. Track the mysterious Knysna forest elephant, board a ferry or take a sunset yacht cruise, hike or cycle in the beautiful forests, take a walk on the beach or sip your favourite drink while watching the sun set over the estuary. With a rich history, gourmet restaurants and a variety of art and craft rambles to add, the options are limitless. Knysna is a vibrant town abuzz with creativity & energy, a paradise for shoppers, where art & crafts abound. A visit to the local fine furniture manufacturers showroom where beautifully, handcrafted pieces from indigenous timber are show cased, is a must. Knysna is synonymous with fine indigenous timbers, and famed for the craftsmanship of its furniture and timber products. The area is a veritable Garden of Eden: home to the only forest elephant in South Africa, the unique Knysna seahorse and the Pansy shell, the brilliantly coloured Knysna Loerie, a plethora of waterfowl and forest birds, dolphins and visiting whales. Famous also for delectable home grown oysters, (washed down by the local brew), quaint pubs & restaurants, leisurely lagoon cruises, as well as the many adrenaline packed adventure sports. The indigenous forests constitute the largest complex of closed-canopy forest in southern Africa, whilst the remarkable richness of the Cape Fynbos vegetation contributes over 8000 plant species to the Cape floral kingdom. A temperate climate and a fine selection of accommodation, restaurants and enjoyable activities make Knysna the perfect holiday destination. Nature – fynbos, forests and endangered species. Bird watching – and spot the elusive Knysna Loerie. Extravagant arts, culture and heritage experiences. Wining and dining and an abundance of seafood, including the renowned Knysna oysters. In Knysna all you have to do is to arrive, the rest comes naturally.